Compared to the rest of the SE network of sites, TGO is quite bland visually. The design is spartan and plain and really just all-together not appealing. It's not ugly either, but it needs its own visual style like the other sites do. Are there any plans in the works to make this happen? I think a nice, looking site unique to TGO would help get more interest here as well. EDIT: Are there any plans or designs for once this site is out of beta? If so can we see what it might look like? All StackExchange sites in beta use a standard theme. 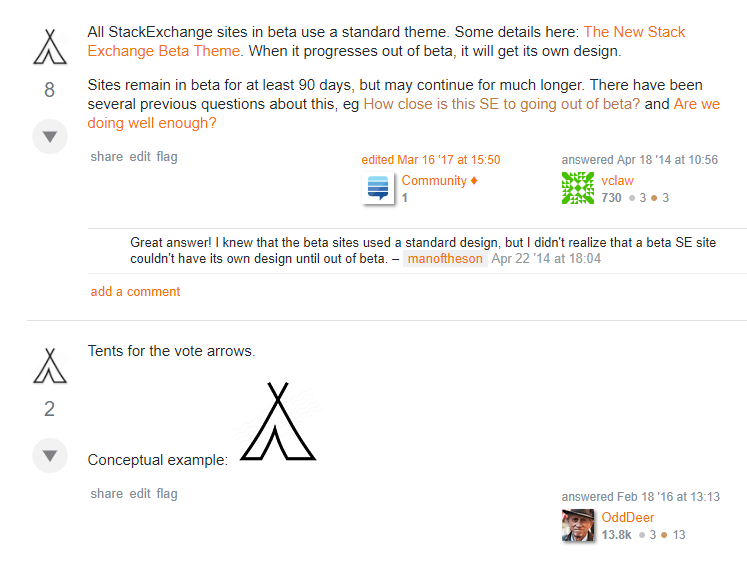 Some details here: The New Stack Exchange Beta Theme. When it progresses out of beta, it will get its own design. Sites remain in beta for at least 90 days, but may continue for much longer. There have been several previous questions about this, eg How close is this SE to going out of beta? and Are we doing well enough? Tents for the vote arrows.